TOPEKA, Kan. – As we enter the busy holiday season, the Kansas Department of Health and Environment is sharing important food safety practices by encouraging Kansans to follow some simple tips to avoid foodborne illnesses. Clean your hands for 20 seconds with soapy water before touching any food. Wash hands and surfaces often during food preparation. Always serve food on clean plates and avoid reusing plates that previously held raw meat and poultry. Separate raw and cooked foods to avoid cross contamination. Use a separate cutting board for cooked foods and raw foods and always wash them after use. Do not cut raw vegetables on the same cutting board as raw meat. Wash any utensil after preparing one food item before going on to the next item. Cook using a food thermometer to make sure all food reaches a safe minimum internal temperature; turkey, stuffing, and casseroles should be 165 degrees F; veal, beef and lamb roasts should reach 145 F; and ham, pork, ground beef and egg dishes should be 160 F. When reheating, leftovers should be thoroughly heated to 165 F.
Chill leftovers within two hours of cooking. Keep track of how long items have been sitting on the table and discard anything that has been out longer than two hours. Keep hot foods hot at 140 F or hotter, and cold foods cold at 40 F or below. Never defrost food at room temperature. Thaw food in the refrigerator, in a cold-water bath or in the microwave. Report suspected foodborne illnesses to KDHE by calling 877-427-7317. Often, calls from concerned citizens are how outbreaks are first detected. Need more information? 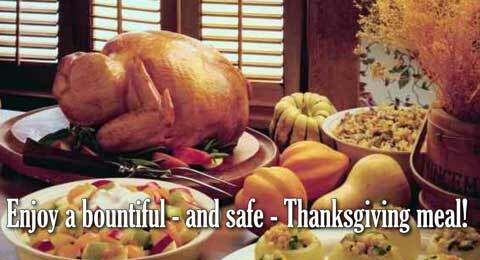 Visit the following food safety websites and enjoy your holidays.